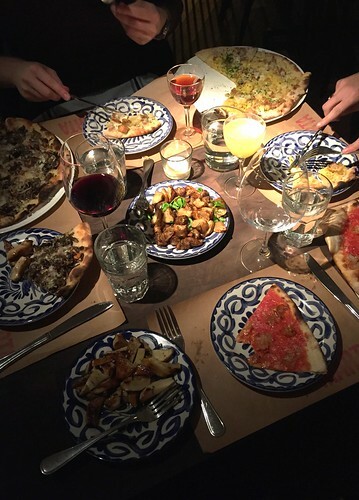 Had a great dinner at Danny Meyer’s new pizza-focused place, Marta, a couple weeks ago with Caitlin, Tommy and Cindy and it seems like everything that man touches turns to gold (or in the case of the Shake Shack IPO, about $155 million). Located in the Martha Washington Hotel in Murray Hill, the restaurant has high ceilings and a good amount of space between tables so patrons don’t feel like they’re on top of one another. And as expected, the service is warm and friendly without being overly hover-y. 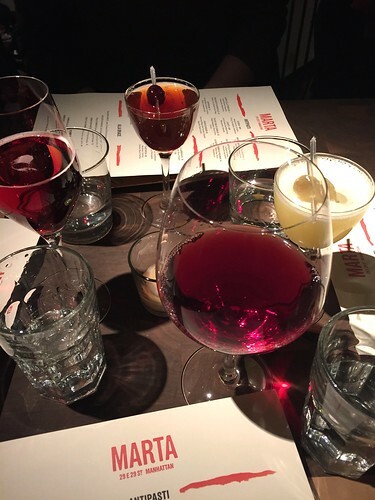 Started off with a various assortment of wines and cocktails, including a glass of Brachetto, a wine I’d never heard of before but turned out to be quite delicate and floral. 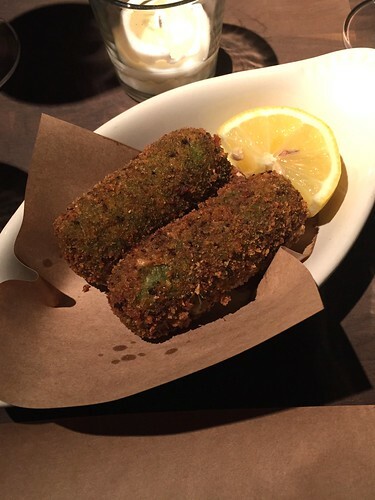 We ordered the green risotto croquettes with mozzarella and mixed herbs as well as the rabbit meatballs with black olives and meatballs for our starters. Both were amazing. The croquettes were perfectly crispy on the outside, followed by a layer of well-seasoned creamy rice (hate bland arancini) and gooey melted cheese on the inside. 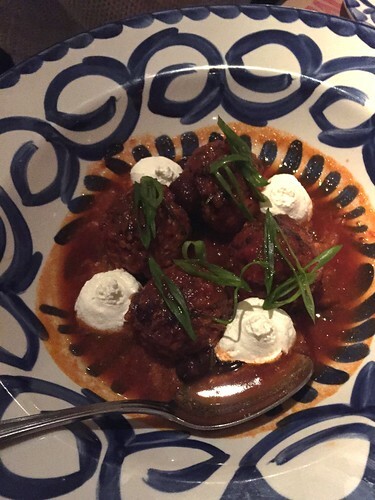 And I don’t usually even like olives but really enjoyed the meatballs, which were very tender and an interesting twist on the classic pork and beef classic. I had a really hard time deciding on a favorite between our three choices, especially since they were all quite different. 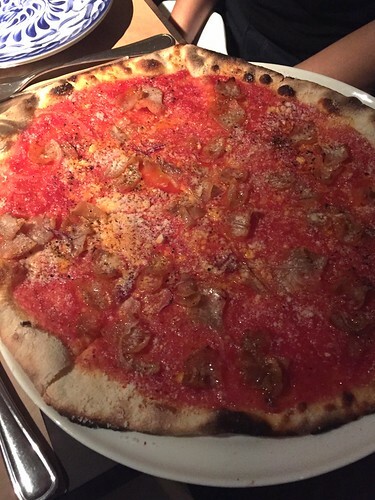 The amatriciana is pretty classic and the red sauce hit a good balance between tart and sweet. On the other hand, I’ve never really had anything like the carbonara version anywhere else, which was super indulgent with all that creamy yolkiness, guanciale and pecorino. 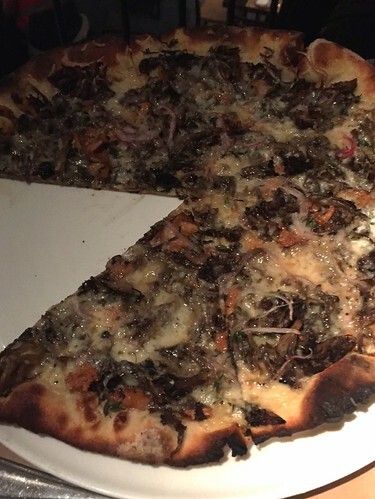 But the mushroom pizza also proved to be standout and tasted quite meaty despite being completely vegetarian. 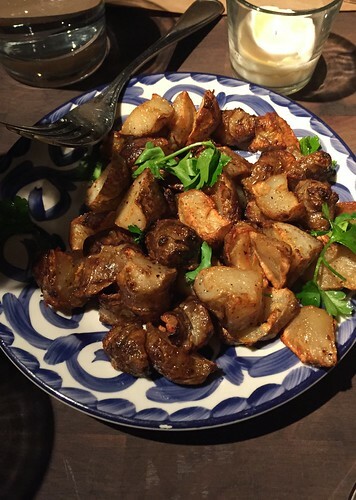 I also seriously loved our side dish of sunchokes (our feeble attempt at incorporating at least some vegetables into our meal), which were super sweet and creamy on the inside. With all the great hype this place has been getting lately, I think it’s becoming harder and harder to get a reservation during prime dinner hours, but if you can manage to snag a spot at the bar or go late at night, I’d definitely recommend doing so. 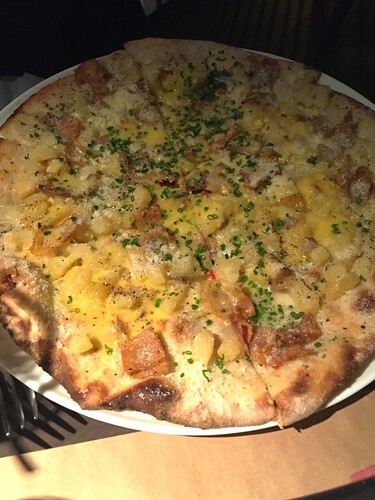 Ohh my goodness these pizzas look AMAZING!!! Wish I’d known about this when I was in New York! You are currently reading Marta at the Martha Washington Hotel at Notes on Food.